Gone are the days of stuffing your SD cards with unnecessary footage, or having to keep checking your phone after every five minutes to see if your garage is safe, or rewinding your videotapes every night to see if there has been any unusual activity. In the fast and busy lives of today’s world, no one has the spare time to do all of that. Thankfully security camera companies have found a solution for us. Due to the rising advance in technology and the continuous evolution of artificial intelligence, security cameras have become so advanced that they can now detect motion and any form of movement and can automatically start recording at that moment. So that the user is at ease and does not have to scroll through a boatload of unnecessary footage and can easily browse the moments which matter. These highly intelligent cameras are called the Auto security cameras and are equipped with advanced software which detects motion in milliseconds and only starts recording at that moment. Some even send alert notifications to the owner. We have listed down, what we thought, are some of the best auto security cameras available in the market currently. 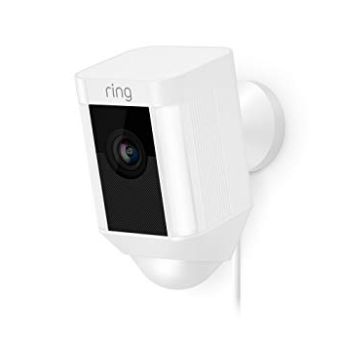 Ring has one of the most advanced as well as the most customizable motion detection software and features. The camera itself is rugged and has a very minimalist and modern design. And is equipped with many outstanding features, including a siren, spotlights, infrared night vision, two way audio and Wi-Fi remote control. The camera shoots in an outstanding High Definition 1080p resolution and has a wide angle 140° field of view, to give the viewers a crisp, vibrant and brilliant video, which will cover a large area of the view, thanks to the lens. The image quality of the camera is outstanding; the level of detail and vibrancy comes head to head with modern smartphone cameras. Other than this, the camera supports two-way audio with noise cancelation. You can communicate with people standing near the camera, from your mobile phone, tablet or PC easily and clearly. The camera has a dual night mode; it has infrared lights which can record clear video in pitch darkness, incognito. And it has a sharp spotlight which can be remotely turned on from your handset, or set on auto motion detection. And if for instance, you spot some suspicious activity, you can remotely turn on the siren, to scare away intruders. The siren itself produces a loud, 110-decibel alarm which can scare away any intruders easily. Lastly Ring has a 1-year warranty for parts and a lifelong theft protection. Meaning that in the event of the camera being stolen, Ring will replace it free of cost. It doesn’t have any micro SD card support, for local storage. No rechargeable batteries, for a truly wireless experience. Weatherproof but not IP certified waterproofing. 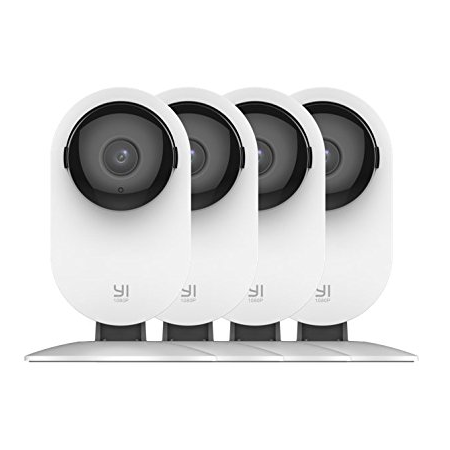 The Yi 4pc Home camera is another excellent auto security camera. It actually is a set of 4 cameras which can be viewed and controlled from a single mobile app. These cameras are basically designed to monitor every room of your home. They can be a great way of overseeing your children’s safety, while you’re away. Or even monitor babies while they sleep. The reasons these cameras stand out are because of their advanced auto-detection features. In addition to an excellent motion detection feature, that alerts the user instantaneously when motion is detected, there is a “baby crying detection” feature as well. This feature is designed specifically for parents with new babies. Suppose a mother has a Yicamera set up near her sleeping baby and is working in the kitchen or the lawn. If the baby wakes up and cries, the camera will automatically send an alert notification to the mother’s phone. Moreover, it records short 30 sec clips with every motion alert and sends them to the owner’s handset along with the alert notification. These short videos are also saved, free of cost, for 7 days on the Yi cloud. The camera itself records a high definition 1080p/15fps, wide-angle video with a 112° field of view. In addition to this, it supports eight 940nm infrared LEDs which can be set to automatic turn on/off in low light. All of these features produce a crisp, beautiful and vibrant video, which can be zoomed in to up to 8x digital zoom, for closer monitoring. It also has a two-way audio channel with which you can communicate with people in your home. Lastly, it supports a Micro SD card of up to 32GB, for storing 3 days (72 hours) worth of footage. The footage can be set to auto motion detected record, as well as continuous recording. No waterproofing, therefore it cannot be used outdoors. 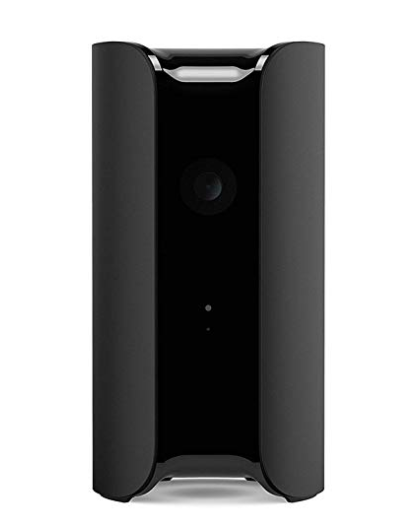 The Canary CAN100USBK, also known as the Canary All-in-one is another indoor auto security camera, but as the name suggests, it’s an all in one solution. In addition to the high definition camera, it is equipped with a built-in siren, a climate monitor, motion detection, person detection, air quality, and night mode. Secondly, the Canary has a loud 90+ decibel siren inside it, which can be remotely turned on from any mobile, tablet or PC, configured to the device. If you spot an intruder in your home or some unusual activity, you can quickly scare them off with the tap of your finger. The camera records crisp HD 1080p videos with a 147-degree field of view. Along with a crisp video, audio can also be recorded through it. Night vision support, allows you to see the crisp video during both day and night. The Canary also gathers climate information, such as temperature, humidity, and air quality and sends it directly to your phone. And can also be connected to Alexa. The canary is not waterproof therefore isn’t suitable for outdoor usage. Its large size makes it difficult to hide. It doesn’t have any battery and relies solely on direct power from a socket. 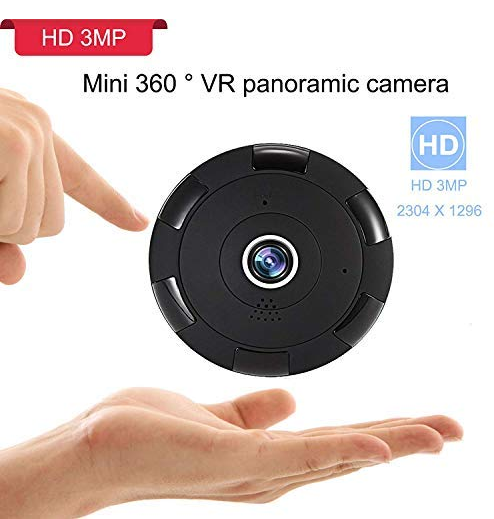 The Ying mini is another excellent auto security camera with a very distinct 360 degrees HD panoramic video recording capability. It’s shaped in an almost flat square piece, which will not resemble a camera, to glancing eye. Any onlooker will have to look at it at least twice, to realize that it actually is a camera. The 360-degree panoramic view means that you can place it on the roof in the middle of the room and cover each and every angle as well as the corner of the room. No need to install more than one camera anymore as this camera covers every single inch of the room with its six camera lenses combining to give you a truly seamless panoramic view. All six lenses are equipped with night vision which can cover up to 10 meters of crystal clear vision in complete darkness. It also supports two-way audio for you to communicate with your friends and family, even scare off intruders if need be. Moreover, it supports a micro SD card up to 64GB to record your videos in a loop or standard formats. It can be set to automatic recording as well. The Ying mini has a very smart AI inside which automatically detects motion, and sends a notification to the mobile phone application of the user. The unusual design, 360 HD video, 2-way audio and auto motion detection makes the camera very suitable for indoor surveillance. The camera is an IP camera but it does not have any internal battery, therefore it will need to be wired in. And as it is designed for the roof, it might be little inconvenient to install it at first. Secondly, it is not water or weather resistant, therefore, it isn’t suitable for severe outdoor conditions. Although this is not a traditional security camera per say, the unique motion detection features of the camera made it an important mention in our top auto security cameras list. 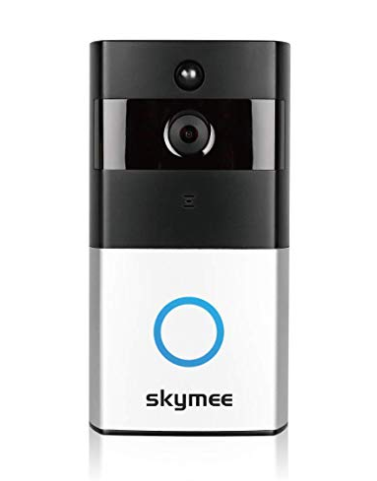 The Skymee smart doorbell video cam is not just a simple traditional doorbell; this specific, unique doorbell has a camera, a speaker, a mic, a battery, IR night vision and a very useful and efficient software running it. The unique motion detection feature in this camera is that , if it detects any person standing in front of the camera for more than a preset time (4 to 5 seconds), it will automatically record a loop video, save that video in a secure cloud, as well as notify the user via the mobile app. You can now check who’s at the door from the comfort of your couch, or even your office. Actually, you can check who is at the door from anywhere around the world. The camera fitted inside records a crisp wide angle HD video of 170° field of view. Along with a strong IR light which can give you a crisp video during the night as well? You can also communicate with the people at the door via the 2-way audio system. For example, if you aren’t at home and you get a package delivery, or you have a salesman trying to pitch you about something, and you just don’t want to face them, with the help of this doorbell you can easily dismiss them, without even getting up from your couch. The doorbell also supports a battery and a low power consumption mechanism. The bell can stay on for 6 to 8 months on a single charge. Although the camera has quite a large field of view, it still may not be able to cover the whole yard for some people. The camera isn’t waterproof so if your front door is in danger of frequently getting wet, then this might not be the camera for you.